Awoke early this morning (0400) and decided to make a go of the day in lieu of tossing about fruitlessly. Filled the woodstove, brewed a cup, and am working on scanning some of the film from the weekend. 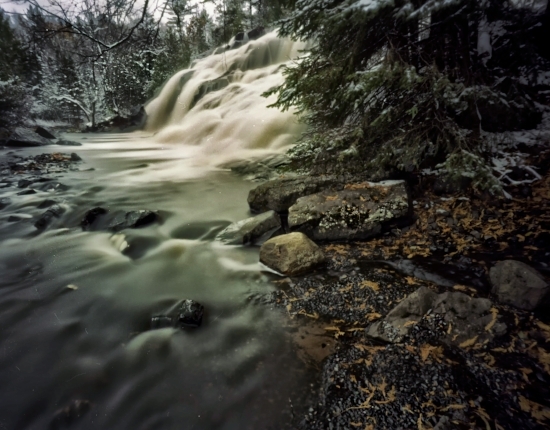 This exposure was made at the bottom and side of Bond Falls, using 4x5 Kodak Portra for the first time. Most of the exposures on this overcast day were 1 minute and 35 seconds in duration with the Harman Titan Pinhole (F206). Having all but shunned color work in film for many years, I find that the more subtle vibrance of Porta more to my liking than the more ubiquitous Fujichrome Velvia in the landscape world. Kodak developed Portra for more pleasing and soft skin tones in portraiture, but it also has a place in landscape work when one’s vision is in alignment with a subtle palatte. The development process for color, which I also avoided for many years, is no more difficult than black and white, with the caveat that temperature is much more vital. With the Arista C-41 chemistry I have been using, a temperature of 102F is essential for good results. There are many expensive options (Jobo processors for example) for maintaining chemistry temperature during development, but I found that a twenty dollar Sous Vide cooker submerged in a large kitchen pot works just fine. Folk legend, John Prine has released his first studio album in 12 years. Now at 72 and still touring, this is a real accomplishment. I remember how much we enjoyed the previous release those years ago, most notably during the Hilly Hundred Bike Tour. Time may not fly, but it certainly ambles by briskly….